Lately, there has been some great information posted at HeartValveSurgery.com about bicuspid aortic valves and aortic aneurysms. Whether it’s our updated bicuspid aortic valve overview, discussions about the genetics of bicuspid aortic valves, or the top 5 facts about the aorta, I’m thrilled to see this new information helping patients and their care partners. To keep the bicuspid valve and aortic aneurysm momentum going, I just posted a new video, “Surgical Innovations: Bicuspid Aortic Valves & Aortic Aneurysms”. 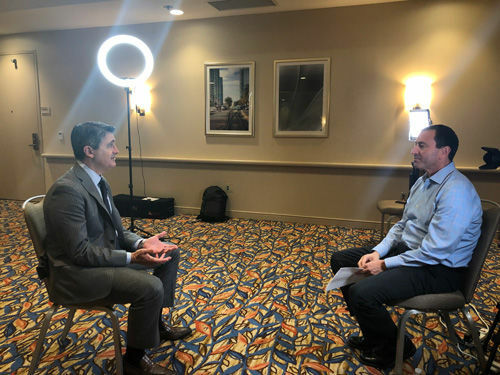 This educational video was filmed on-site with Dr. Eric Roselli, the Chief of Adult Cardiac Surgery at the Cleveland Clinic, at the Society of Thoracic Surgeons Conference in San Diego, California on January 28. If you have been diagnosed with BAV or an aortic aneurysm, I really encourage you to watch this video. There are so many great points that patients and caregivers can learn from this surgeon interview. Plus, Dr. Roselli is a definite guru in this space. That said, you will learn about the latest surgical techniques and the clinical research that supports the different bicuspid aortic valve and aortic aneurysm treatments — including the Modified David Procedure. What Should Aortic Regurgitation Patients Know About The New HAART Annuloplasty Ring? Learn More.